Euro-space.net is a Sweden-based provider which has been operating since 2007. Fairness and honesty are what make the key message of the company’s website – regardless of what service you use, the quality remains the same, the rates are transparent, and the provided support is something they take pride in. Euro-space.net, being one of the web hosting providers with a good reputation that are praised on the Internet, has a data center in the UK. The list of the company’s services includes varied hosting-related solutions. Its target audience is individuals and businesses of small and medium size based in Europe. The company offers free website building tools and provides quality hosting using advanced Cisco hardware. The fact that they update information on their website (for example, many hosting providers forget to update the footer for some reason) and the live support chat let the client-to-be know that they do their best to maintain the quality of services (of which the website is the representation), and are ready to serve you at any time. Currently, there are 3 shared hosting plans: Standard, Business, and Ultimate. All plans can be purchased only monthly. The prices are in the table above. Business plan has a promo offer: $6.9/mo for the first billing term. The company offers contact forms and emails for support. 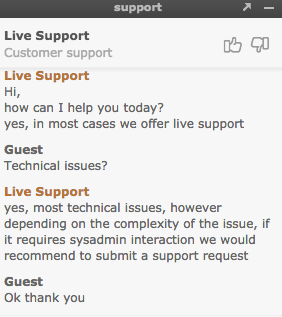 Live chat offers basic tech support as well. 7.1 HRank and #64 are the results for Euro-space.net in 2018. Not bad, really. Uptime chart reveals 100% uptime in the monitoring period with only one case of ~98% downtime and one case of ~99%. Response time was less colorful: the chart reveals instability in response and speed fluctuations between 600ms and 1,000ms. 1 Shared IP stayed the same but the number of websites decreased in 2018.